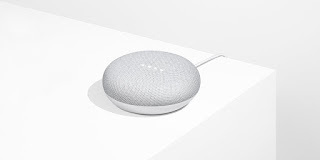 Google today introduced Google Home Mini at an event in San Francisco. Powered by Google Assistant. The compact version of Google Home will let you talk to the Google Assistant to stream music, control your smart home, check your calendar, and search the internet. The Google Home Mini sports the similar fabric speaker grill at the top and a plastic-looking base at the bottom. The images also show three micro-LED lights on top. Google Home Mini comes in three color options – chalk,” “charcoal,” and “coral priced at $49 It is already available for pre-order and will start shipping starting October 19.